SUMMARY: As the bearer of the sacred Godstone, Princess Elisa must be protected at all times, or at least until she can fulfill her destiny. Secretly married to a King Alejandro, Elisa travels to Alejandro's desert home, where she must navigate betrayal and secrets to uncover her destiny. WHAT I LIKED: Great writing, world-building. Carson's YA fantasy debut takes its time establishing Princess Elisa's politically tumultuous world. Detailed descriptions of elaborate palaces and sweeping landscapes help readers visualize the settings. Character development. Princess Elisa, King Alejandro, Cosme, Humberto, and Belen are realistically flawed, which I always love. I especially loved Elisa's honesty, intelligence, and personal growth throughout the story. I love Alejandro's laissez-faire attitude, Humberto's simple determination, Cosme's fierce will to evoke change. WHAT I DIDN'T LIKE: Sometimes, a novel has everything going for it, but for whatever reason, I just don't connect with it. 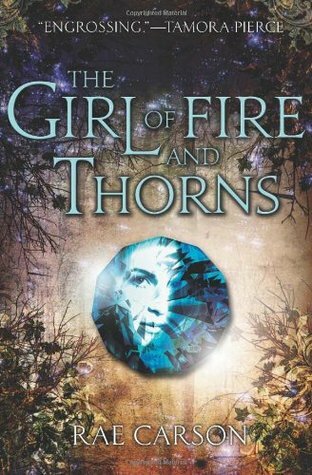 Girl of Fire and Thorns was such a novel. It took me forever to get into the story, and even then, my interest fluctuated from one chapter to the next. I wanted to know what happened, but I didn't enjoy the journey of getting there. I cared enough to finish, but not enough to be excited about it. The religious stuff. Elisa's Godstone and the history of Godstones are central to the story. Elisa prays frequently, consults with priests, studies sacred texts. Nearly every page has something religious on it. I get that the Godstone is a huge part of the story, but for me, it was just too much spirituality. THE BOTTOM LINE: The writing, world-building, and character development are top-notch, but I didn't really connect with the story and its strong religious overtones. STATUS IN MY LIBRARY: We have it, and it has gotten a few checkouts. Let's start a discussion! Does serious spirituality in a book cause you to like it less? Spirituality in a YA book actually makes me MORE inclined to pick it up, lol. I think most teens consider spiritual issues at some point, to one degree or another, and some already embrace a religious faith, so it seems like a relevant topic. Like with other topics, fiction can provide a safe place to explore spiritual issues, and it can increase understanding and acceptance of other people's faith practises. I am still undecided about this book. I see it in the library and I am like "next time, I promise." I just got this from my library and it's next as soon as I finish Insurgent. Not sure if I'll like it with all the religion but I'll give it a shot.